APX XE “SP” Channel Knob? Thread: APX XE “SP” Channel Knob? Why would Motorola have a part that anyone can look up, but no one can buy? If its a restricted part, its a restricted part. So I've noted, my order for CPS is on credit hold, day 20 yet. If we're being real here... I don't get the appeal of these things. The short stubby non-XE channel knob that was discontinued early in APX production was a much better option imo. Why would you have an item on your site you know you can't sell and Motorola even went so far as to personally contact you about? Other than clickbait, of course. What a travesty! We were able to order them, so we had them listed. Far from clickbait. Don't be a hater Jeff. I will get started on making a model for this soon. I will try to make it fit the standard and the XE. Are the 7000XE and 8000XE physically the same? I have not laid my hands on an 8000 yet. The drawing helps a lot, but does anyone have a more clear picture of the knob? Found this picture...it is a little bit more clear. Very interested in the carry holder. 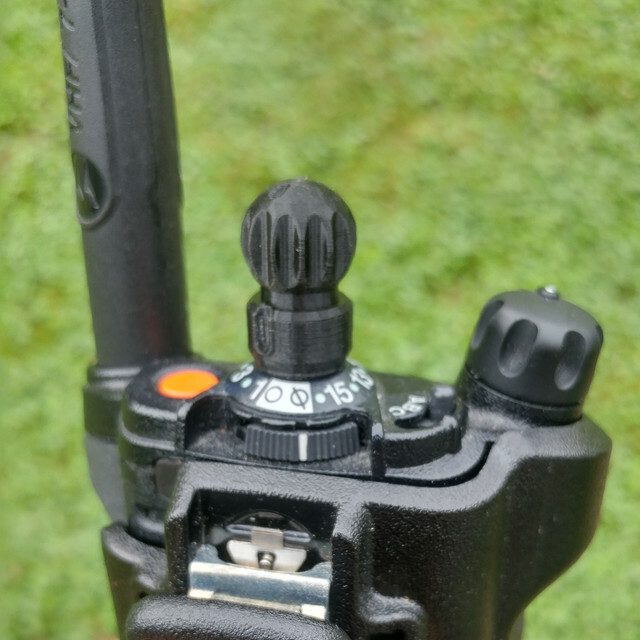 While the Talon is OK, it's only available for XE radios and really beats up the control top. So I have been working on this every once in a while and have almost completed everything I wanted. I have made a good fit prototype for the 6/7/8000 and have almost completed the fitting on the XE model. Here is a rendering of the FDNY knob along with some photos of it on a 7000 and a 7000XE. 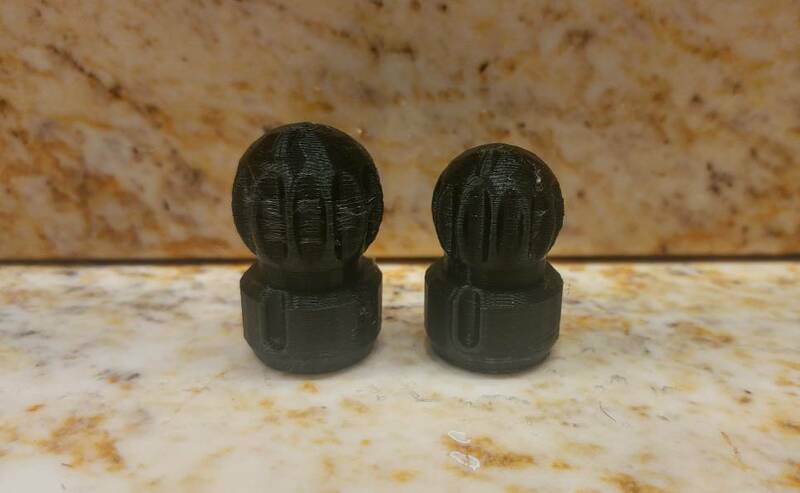 The one on the 7000 is printed at a layer height of 50 microns and the one of the XE was a quick print at 300 microns because it is easier for testing. 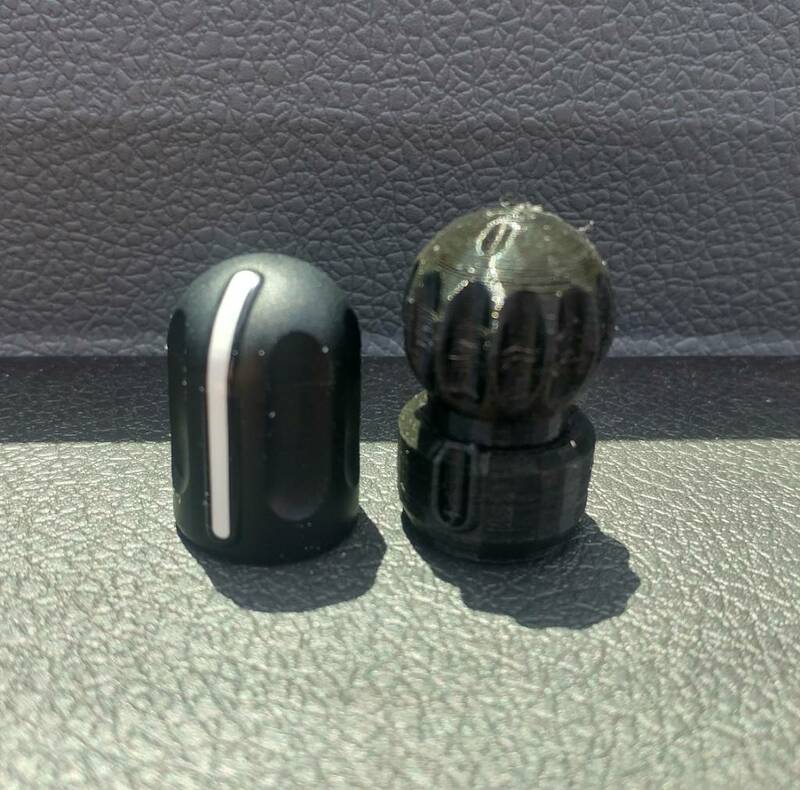 There is a picture of the original XE knob along side the FDNY knob which is slightly bigger. 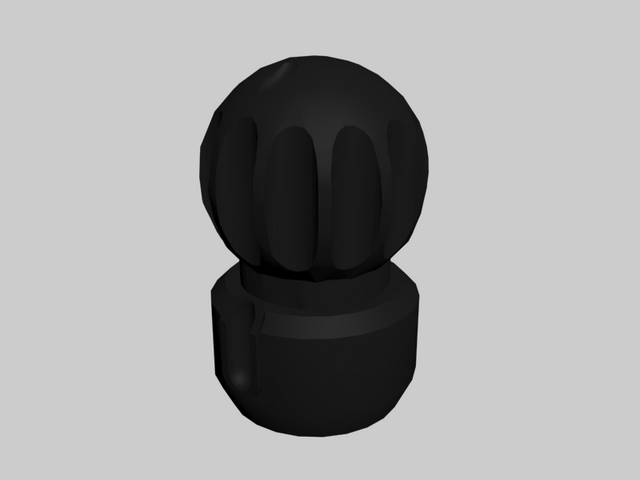 I have also been working on an alternate knob for the 6/7/8000. I think the original fat knob is good enough but I don't like the skinny knob. This knob turns nicely and I think looks nice on the radio. It does cover the channel labels but it displays what channel you are on as well as the adjacent channels. Let me know what you think. When I am done I will upload the files so you can get some printed. One note, I have tried to use without the steel retainer and I think that the use of it is required to have a good fit and not fall off. So I have made these to use one. for the 6/7/8000 series they are extremely difficult to get out of the stock knob and they don't come separate from knobs. However, I have found some matches on other radios and I will give the list of fitting inserts that will work with this as well. Very nice work. What exactly do you mean by steel retainer? I don't believe my 7000 has that on its knobs. Definitely planning on printing a few once you release the files. I'll probably send them off to shapeways to be printed on an SLS machine for very high detail. I dont have a macro lense but this is what I mean. Most commercial knobs have them. I can produce files with and without. Great work! Here are a few pictures that can help further. Last edited by triptolemus; Jun 01, 2018 at 11:02 PM. Reason: Please avoid quoting large images. I was able to get some much better pictures of the knob. Also, look at the volume knob, it looks like maybe an RFID knob for the XE maybe? Nice photos. Looks like the main difference is the top is smaller than mine is. Here is my finished one that fits good. Do you want the top smaller? Would be less torque, haha. Also, the top part looks like a copy paste of the 3000/5000 channel knob, lol. Wonder how much they paid for that. Yes, you are right. The top of this knob is the exact same as the XTS5000/3000 series. And knowing motorola and the city of New York, it probably cost a ton! Take a look at this photo...looks like some special screw on the speaker mic connector. I’d imagine so it doesn’t unscrew easily? 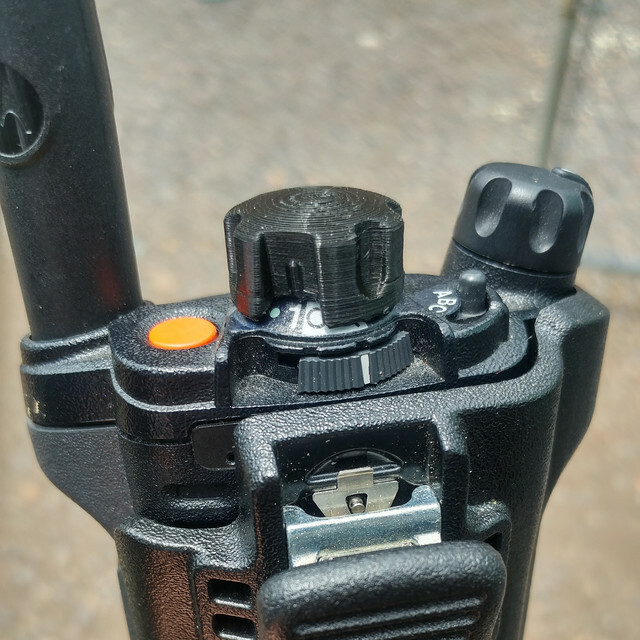 Only problem with this is, if the speaker mic fails or say the cord gets damaged and the mic no longer works, in an emergency situation the user will not be able to hear any audio coming from the radio...unless of course they had the special screw driver to remove it. That’s the ATEX screw. I have it on my ANC ATEX RSM. Supposed to be for UL IS as well, I believe. I know you can program the mic to be either radio (if radio PTT was used) or RSM (if RSM PTT was used) but not sure about speaker. Maybe there’s a button setting assignment to switch off the RSM? Do you have a picture of this screw? I have not seen it before. And as far I know yes, you can transmit from either the speaker mic or the radio but audio is always routed to the speaker mic. I do not believe you can turn this on/off. But I am not certain...maybe someone else can chime in. See this PDF... Zoom in on photo on page 1. 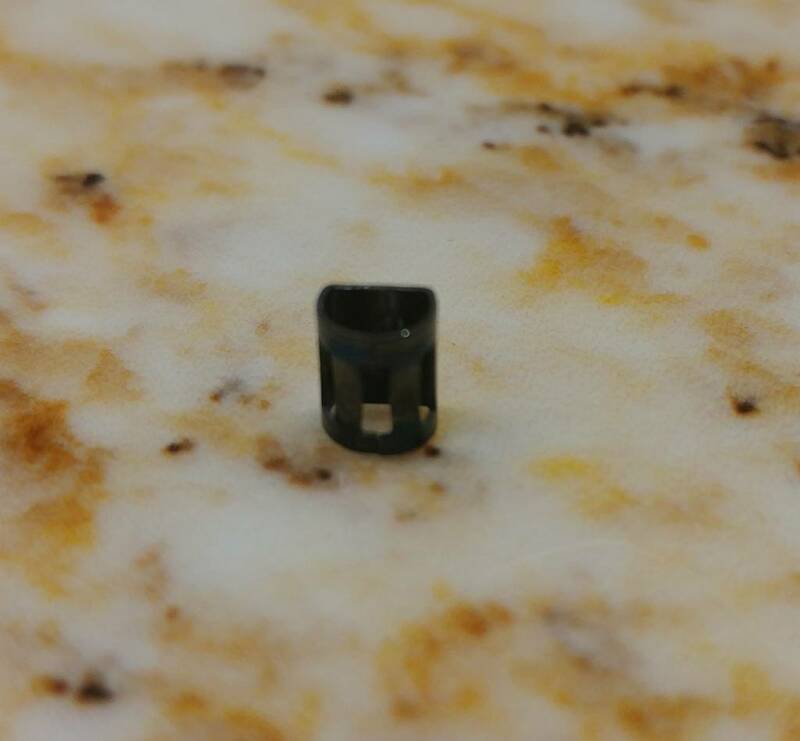 It's basically the same thread, but the head is a round hex nut type....not thumb screw. A good indication that parts are "ATEX" is that they have a lot of "black". i.e. the lapel clip base is black...the epaulet D-ring is black, and the RSM attach screw is black. Actually, it's an XTS2500 AN knob top, transplanted onto an APX-fitting cylinder. I usually swap my BN XTS2500 knobs out to AN ones, they are easier to grip than the skinny BN knobs. Also, the XE RFID volume knob looks like it has a radio-wavey type symbol on top? That would be a universal "radio" icon, I guess. back to the thread topic: I can’t see how this new SP knob is better than the standard one. This SP knob looks like it could catch on things and shear off. I have made the top smaller. The original one is the same size as the base but the top is smaller on the new one and looks right in comparison to the FDNY. I held it up to a xts5000 knob and it is pretty much the same size as that one. This photo is from Wednesday. 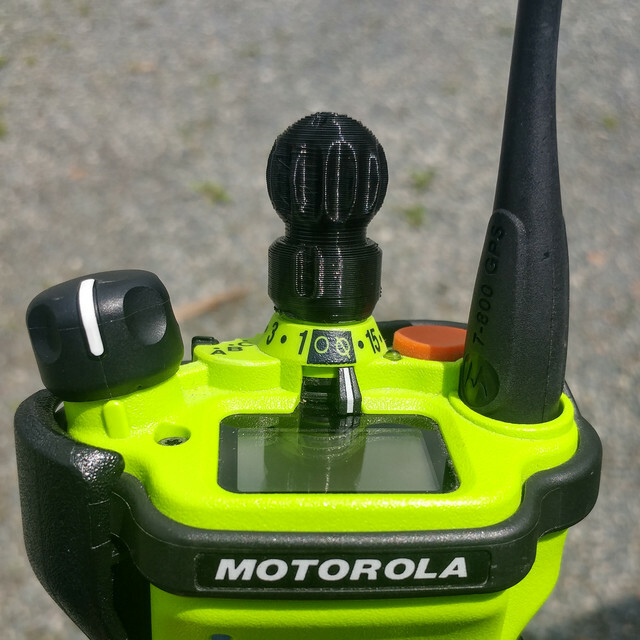 I haven’t seen many fire APX radios up close yet. I’m curious as to the feedback from FDNY and as to the functionality with these knobs? I’m wondering if they did this since they used the XTS3500/5000’s and they have the same knobs? Maybe a comfort thing?